ITV boss Michael Grade is forming a 'war cabinet' that will challenge the UK government's plans to sell off the analogue TV spectrum. Instead Grade wants the bandwidth to pipe terrestrial high definition TV content into millions of UK homes. Grade has called for a meeting with members of the HD For All campaign to come up with a battle plan. 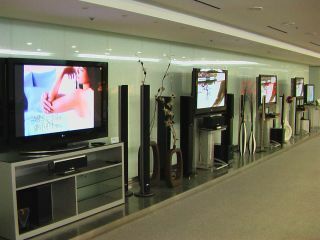 HD For All comprises of leading broadcasters and consumer electronics companies. The aim is to challenge the government's planned spectrum sell-off, wresting it from the hands of UK mobile phone networks who are currently the most likely recipients. "Retailers, manufacturers and rival broadcasters are determined to get the government and the regulator to understand ... the level of consumer anger they are going to face after analogue switchover when the public realise that they will be unable to receive their favourite channels in HD on Freeview on the HD-ready TV sets they are buying in their millions," Grade told the Sunday Telegraph . Grade has been joined in his criticism by Sony UK boss Steve Dowdle who said the government is "currently heading for a disastrous outcome that will deprive the majority of the UK public of HD for at least a generation if not more". His statement comes in an open letter to government culture secretary Tessa Jowell. Dowdle also said that Freeview faces an inevitable demise and that the government will create "a two-tier TV society for the first time in our broadcasting history."